"You also must be ready all the time, for the Son of Man will come when least expected" Matthew 24:44. There is no shortage of writings about the last days-often full of speculation and sensationalism. Where can we go for information we can trust? Join Bible scholar Ron Rhodes for an in-depth look at what we know to be certain about the last days-based on key teachings directly from Jesus. You'll learn what the Lord Himself said about the rapture, the tribulation period, the second coming, the future judgment, the millennial kingdom, and more. So-are you ready for what is to come? Enjoy a fascinating survey of the end times through the words of Jesus Himself, and gain the very best of what you can know about God's plan for the future. 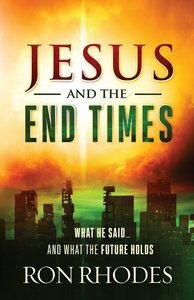 About "Jesus and the End Times"